Winning the lottery may seem like a dream come true, but the fear of getting robbed after that? Not so much. 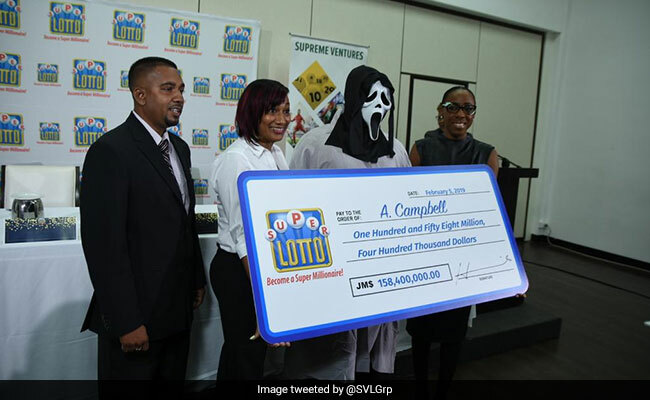 That's why one lottery winner in Jamaica decided to hide his identity by wearing a Ghostface mask from the Scream movie series while collecting his cheque, giving social media some hilarious pics in the process. Identified only as A Campbell, the lottery winner won 158 million Jamaican dollars - or approximately 1.1 million USD - as part of Supreme Venture's Super Lotto. "I want to get a nice house. I haven't found it yet, but I'll be looking for one soon. I like to handle money. I don't beg, I don't borrow. So I'm looking at things that can turn over the money. I have a little business, so I plan to make it bigger, buy an apartment. I love to have money," says Mr Campbell.